This is often called the mantra of Don’t Repeat Yourself: programming is an evolution with continuous improvement. Nobody should have to write the same code twice. This is similar to when a client or customer calls you and you know exactly how to solve their problems after they speak the first sentence. Sure, maybe 5% of the time you have to wait for the second sentence and you think: ‘Oh wait, they’ll need to zig instead of zag.’ Most doctors and therapists can correctly diagnose patients within a few minutes of listening to them. The rest is just kabuki and placebos. This principle is ignored in businesses everyday when someone thinks that what they are doing has never ever been done by any other company in the history of the world so the rules of logic or business or common sense simply don’t apply. There’s a reason why conventions are conventional: they usually work. And if they don’t work they can help you understand what you might try next. I’ve been rolling a framework around in my head for a while. A model that combined my views on internet business into one big tuna noodle casserole. I’m compelled to make it all fit into one Grand Unified Theory like they do in physics. Maybe I’m trying to force a square peg into a round hole (whole?) but I think it is a worthy mental exercise and perhaps others can learn from it. Part of this stuff is for a course and book I’m developing right now. [W]riting a framework is one of the best exercises you can do as a web developer. So regardless if you plan on using the framework you write is irrelevant though I suggest you do because ironing out the fine details will make you a better programmer. “The best way to understand anything is to take it apart and reassemble it. In this case we won’t be taking something apart but we’ll be assembling it. First off we’ll need to redefine what a framework is. From Wikipedia a framework is “a defined support structure in which another software project can be organized and developed”. This is kinda pushing me over the edge. Part of me says keep all of this private and work on it privately so nobody can steal it which is completely opposite what I’d tell a client and there’s probably a wealth of insight that exposing the process of creating my framework. And most likely the fundamentals of what I’ll be exploring have been collated and examined by others elsewhere. But as we’ve said before, there are tons of people saying the same thing you are – but the fact that it is coming from you – focused and filtered – is your competitive difference. ‘Instant Global Impact’ is a slogan I’ve batted around for several years now. It is a spin off the chapter from Blogwild titled ‘Instant Global Self-Expression’ and I swap in impact for self-expression since businesses are less concerned with their employees being self-expressed and more in touch with having the fastest and strongest impact possible. So I’m going to call this the Instant Global Impact Framework for now. I’m sure once it catches on it’ll be called the IGI Framework or just Wibbelism. Kinda like when a few actresses I’d directed went on to use my creativity coaching skills in their own productions saying ‘we’re using the Wibbels methods’. Move over Jim Jones! Usually we take the perspective of the business owner and start with logistics and other un-glamous stuff like forming a corporate entity or registering a tradedmark or other ‘grunt-work.’ Or we start the dreaded Well what’s your passion? exploration (where you have to talk softly with a sibilant lisp). Then after we’ve gone through some more boring documentation we get to the fun part – taking the point of view of your customers. But let’s start there. Start with the point of view of your customers and the structure/system they go through to become a part of your life. Let’s work backwards: A customer clicks on the BUY button on your website. They give you money, you give them a product. How did they get to that point? Customers buy when they like you, when they trust you and when they’re ready (I think that comes from Michael). How did you build that trust and be first on the list when they decided they had an itch you’d be able to scratch? Somehow, they got on a mailing list or newsletter or feed subscription. Somewhere along the line, they clicked to SUBSCRIBE to some sort of vehicle where they got to know you over time. And what brought them to that subscription form or other type of opt-in? They were looking for content or expertise about a certain topic or problem. They may have clicked a button to SEARCH using their favorite search engine. It could also be seeing you on TV or hearing you on the radio or getting a referal from a friend – this is a bit more abstact then a search button but I think it still helps to express how content or search results gets people to find you and then consider joining your network or newsletter or community. Let’s take it forwards: A customer is researching a problem or passion, they SEARCH their favorite repository of information (like a search engine or social network or their own personal ‘flesh/blood’ network). 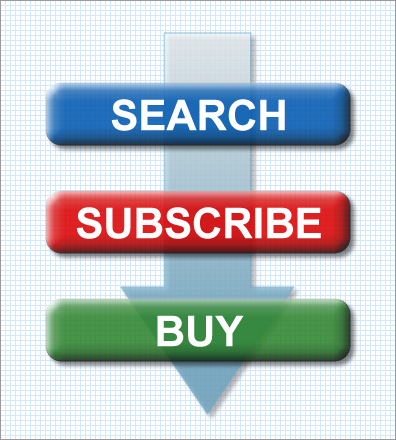 They find compelling content that points to some sort of opt-in or contact capture or subscription form which they fill out and click SUBSCRIBE. Then you start ‘dating’ this prospect and gradually they get to know you and either you build trust and credibility or you fall of their radar. Then, when they need what you have they click BUY. Ha – it is kinda like a three-act play! The marketing tactics and creme filling is what happens before and after these three different buttons get clicked. These three buttons are of course a gross generalization of the overall process – someone might not actually SEARCH for you. They might enter your URL into their browser or click from an article you wrote or some other way that makes you pop up in their real or metaphorical seach results. There’s a lot of caveats to throw under the bus, but it helps to chop things up into three parts from being completely unknown to a potential customer, orbiting their lives to finally being needed and being able to provide them products and services. So that’s the top-level 30,000 foot view of the framework I’m working on. Next week I’ll go a bit further with what happens before your customer clicks SEARCH. Three buttons. So simple but not really. Looking forward to next week’s “episode”! Merlyn: commenting is about getting generative conversation going, not saying “thanks and when can I have another?” it would be so much richer had you actually posted some substance instead of using the comment box to indicate your expectation of another freebie. You say: “…so simple but not really”. HOW “not really”? It sounds like you have some knowledge in this area. Andy’s asking you to share that knowledge. Come back and let us all know. Thanks. And everyone who replies to a blogger’s considered words: Give them some love in gratitude for their (in this case, magnificent) essay, and pay for that next installment of rich information with the favor of a substantial comment. What I think Michael also outlined that helps your model, in both the “Search” phase as well as the relational portion of the marketing cycle is “always have something to invite people to”. Most of us do a monthly (or in Michael’s case, weekly – still don’t know how he does it!) tele-gathering of some sort that fulfills this parameter. A personal touch/high attendance condensed ROI form of giving people that “pink spoon taste” to quote Andrea Lee, of our information, services or product. Beyond the by-now-staid teleclass/seminar, what other large-scale high-touch snippet of a person, if a person is the product in part, can we give people who are interested in what we provide? One possible solution are social networking sites. I invested a large amount of time in developing viral IP. In this case, a free method that creates consciousness and as a side-effect, instills vibrant health, busts blocks and leaves you in a place where you have all the answers. It’s faster, more elegant and completely invisible in use compared to other methods currently on the market. People like it, say it’s kickass & works wonderfully. If interested, it’s at http://community.ethosmethod.com. The time spent creating the method can be compared to the time spent to create a really good viral ebook or video (only longer as limited clinical trials were involved). It was important that the viral media was truly packed with value. I invested a smaller amount of time and money in creating a social networking site using Ning.com to vend the viral IP. That site to date has gotten more play than the community site associated with my recent book, which itself was wildly popular, but fell down on getting a vibrant-enough user community going so far. This site too is value-packed (if interested, http://everydaybliss.org) and has many of the same elements – more in some areas. But the new IP site is more active. Is it the platform? (Ning versus Joomla) Is it the content? (each are similar) What differs that can be duplicated successfully? I’m currently looking at why this is the case and what parameters of this model can be tweaked to provide a more desirable response. Not a complete answer, but the beginnings of one. Nassim Taleb ” Black Swan” parallel– All you can really do is increase the probability of your desired outcome. It is not predictable so you must do everything possible to show up and watch for serendipity. Marketing,trust,sincerity, availability are all ingredients in this showing up process. Of course the ego wants to think it is all predictable so when something desired happens, ego will say– “yea, I did that on purpose.” Closer to reality, you jumped in the spotlight, nevertheless, you arrived. Andy this is just about the best thing I think you’ve ever written — and I’ve read LOTS of your stuff. Man you just keep getting better and better. Don’t stop! Insightful post.Getting people to find your site, then sign up for your newsletter, and later on buy something seems easy.But in reality it takes some skill to build a huge customer base. Without a doubt, Tom! It isn’t easy by any stretch of the imagination. But it is harder to start from nothing versus going with what’s worked for others (and swallowing some pride as well!). I saw your video on Youtube that Problogger made. It’s about the things and tips on succeeding on blogging. You have have a very nice tip. I’ll remember that. Thanks! Thanks Andy. Your book motivated me to start my own blog. I surely can identify with that change one piece of PHP and see if it blows up. It is a huge consolation. Trial and error is the way I proceed. And I believe I will get to the 3 buttons! Your help is invaluable!